During the extended storyline featuring Scourge--the anonymous killer who stalked and gunned down nearly thirty super-villains in a number of Marvel titles and capped each kill with the phrase, "Justice Is Served!" --there were arguably two aspects to his story that stood out for readers and made the character a fascinating one to watch. For one, the fact that he would appear so unexpectedly in a story to make his kill, his history and motivation completely unknown; and secondly, that there were likely a few of his victims that some readers perhaps didn't want to see meeting their end, for whatever reason. Of course, that last assertion works both ways--some of you no doubt didn't object at all at the removal of villains you regarded as uninspired or a waste of space. *Though not in response to a letter, it should be noted... this was at a time when book editors often crowded out actual letters with their own thoughts and addendums. The Melter - As ruthless as they come, which adds to his character much more than his actual power. (The original Frightful Four are probably remembered more for their ruthlessness and chemistry together than whatever abilities they wielded.) The Melter needed a better method of discharging his power than a hand-held gun or a chest emitter--but he's deadly and cocky, assets for any memorable villain. The Human Fly - The character initially came across as having a lot of thought put into both his appearance and his power, and I really enjoyed his origin story. I wouldn't want to see him as part of a group, but I'd definitely put him in the Vulture's league in terms of villainy and deadliness, if not staying power. Miracle Man - Granted, his story has probably run its course, his origin tale being given a generous follow-up. 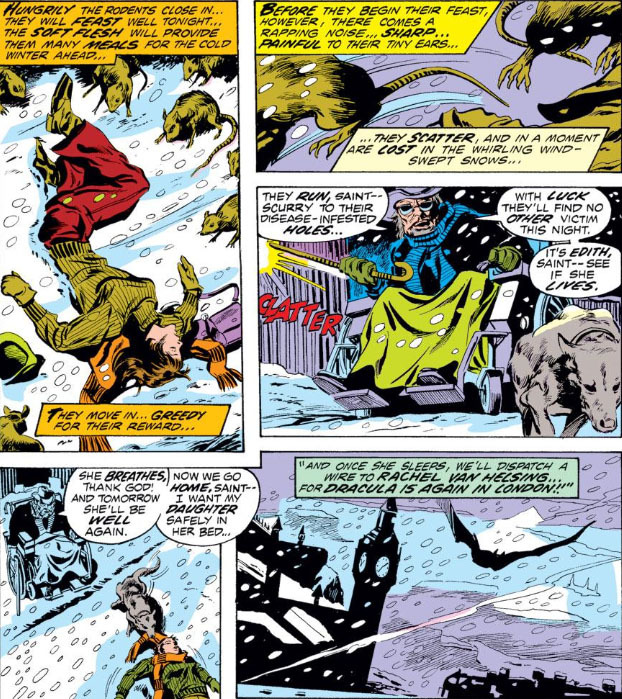 But if villains like Count Nefaria and the Wizard continue to rate mileage, the Miracle Man's ambition and villainous nature should be able to go the distance. Firebrand - Gary Gilbert's compelling quality has always been how misguided he became in his violent approach to dealing with the establishment; that, and his striking costume (I really liked the design of his chest symbol), gave a writer a good deal to work with. His only real drawback came down to those arm-blasters of his, which did a poor job of conveying the power that he commanded. 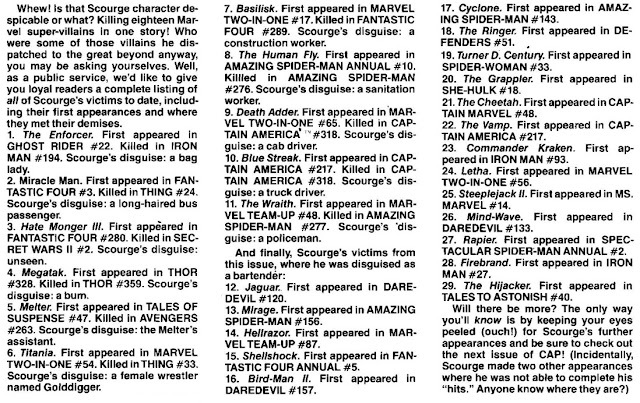 The real controversy regarding the mission of Scourge would have been if he hadn't limited his targets to second-string (in some cases third-string) villains, and taken out three or four more prominent characters (e.g., the Wizard, or Nefaria, or Baron Mordo, or Zemo) who also could have been stalked and dealt with by a master of disguise. In any case, do feel free to share your thoughts on those who either made the list of dearly departed here, or other characters who you wouldn't have minded seeing tacked onto it. 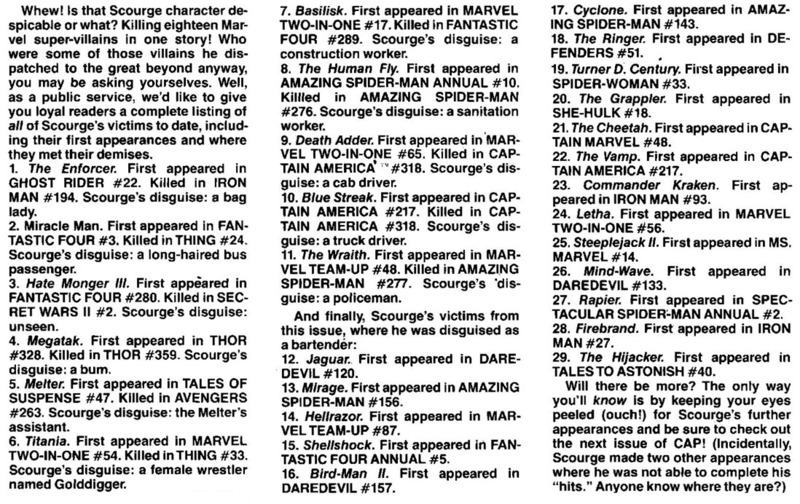 When it came to villains from the '80s, heaven knows Scourge had his work cut out for him. 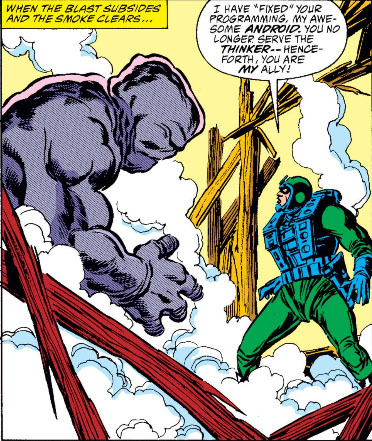 OR: "What A Way To Spend A Vacation"
With all the exposure the Kree have received in The Avengers, how curious that we first learn of them in the pages of Fantastic Four, and in only a limited number of appearances at that. 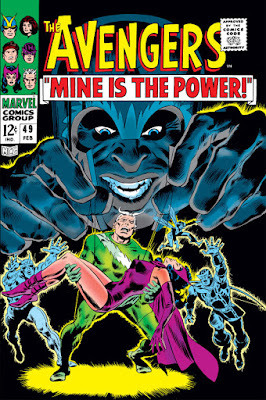 As a mysterious alien race that apparently visited our world long ago, they're given quite a build-up in a pair of 1967 back-to-back FF stories; but whether by design or because of opportunity, the Kree were diverted to other titles for the time being. First, they would be briefly passed over to the Mighty Thor book at the end of the year, where they would play a part in a major revelation involving the Inhumans--and, during the same month, they would also factor into the debut of Captain Marvel taking place in Marvel Super-Heroes. Three months later, it would fall to the new Captain Marvel title to expand on their threat, where unfortunately the Kree didn't live up to expectations (much like the book itself). 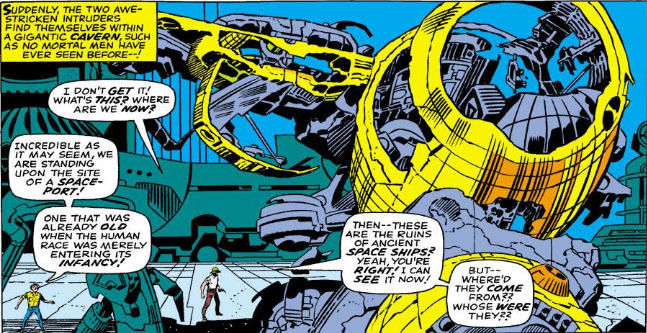 In Fantastic Four, however, we were given a lot to look forward to concerning the Kree, when a professor researching an alien civilization arrives on an island in the Pacific and uncovers not only the evidence that he's been seeking of their existence, but also a remnant of that race that lives up to its name--the operative word, unfortunately, being "lives." And so Sentry 459 makes his first appearance and heralds the debut of the Kree race in Marvel lore. 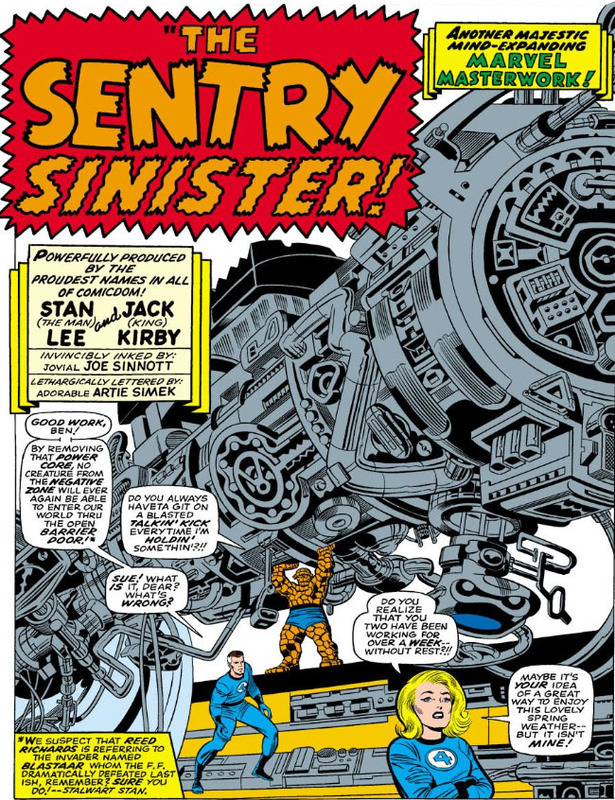 But just how long has the Sentry been dormant? 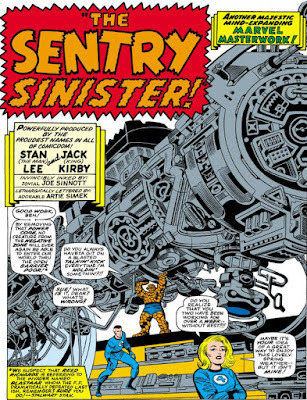 As we'll discover, the Sentry was walking the Earth during the formative stages of mankind--but in the here and now, it's the Fantastic Four who must bear the brunt of the Sentry's reawakening. With Halloween just around the corner, it's the perfect time to bring forth the monsters! And for that, we need look no further than the incredible Hulk, who has often been called such--only this night, he battles one that may be more deserving of the name, even before the transformation that leaves him in the streets slithering for prey. 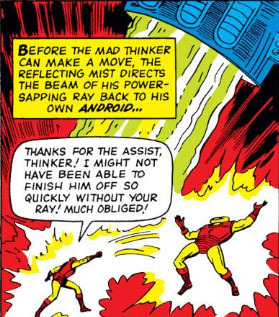 One Marvel character who has always flown lumbered under the radar is the Mad Thinker's so-called Awesome Android, which seldom if ever makes appearances without his awesome adjective. 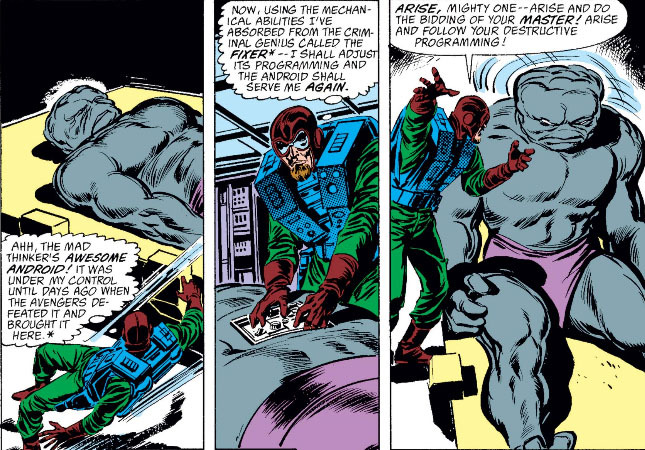 Making his debut in Fantastic Four, he owes his basic makeup to the notes of Reed Richards, though it would be the Thinker who would go on to construct and activate him. The android's specialty is to alter its form to suit its attack posture, including the ability to mimic some of the abilities of those who go up against it. 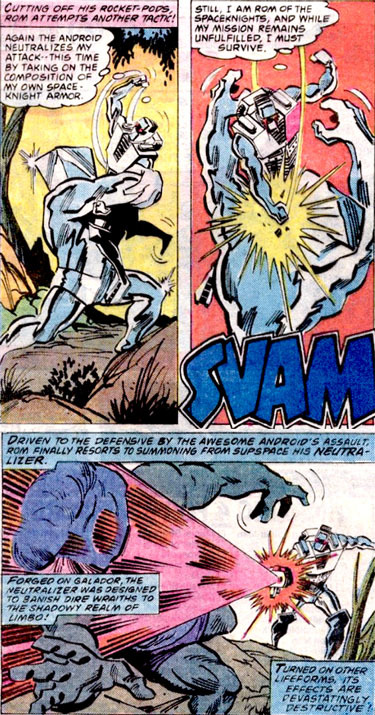 It thus becomes a more versatile foe than, say, the Adaptoid, who tends to imprint a target and stick with that form for the duration, though its adaptation might comprise several forms at once. The Android enjoys visibility in Marvel Comics to this day, marking its staying power to a span of over fifty years. 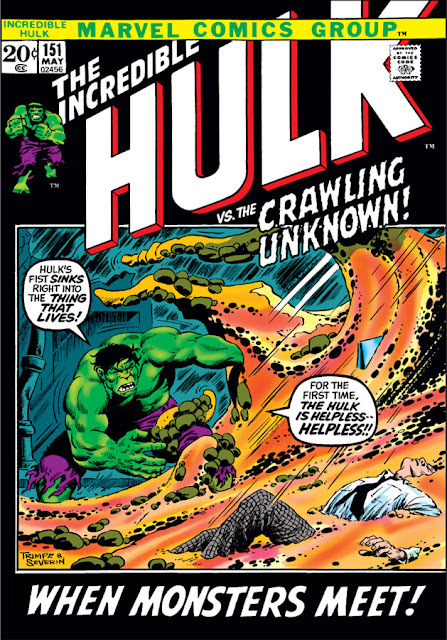 Yet aside from a more humorous evolution of its nature in the pages of She-Hulk, for the most part it's remained a handy tool for whatever writer requires a large, no-questions-asked menace for their story. 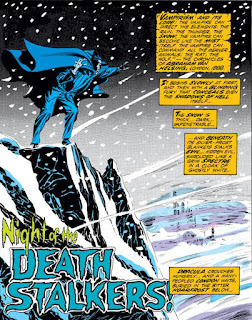 What follows here isn't a retrospective of the Android so much as a sampling of its various appearances as it progressed through early Marvel history, which should give you an idea of not only why a writer might schedule it as a threat, but also should demonstrate how its abilities and silent demeanor, which remain constants, nevertheless continue to fascinate readers. 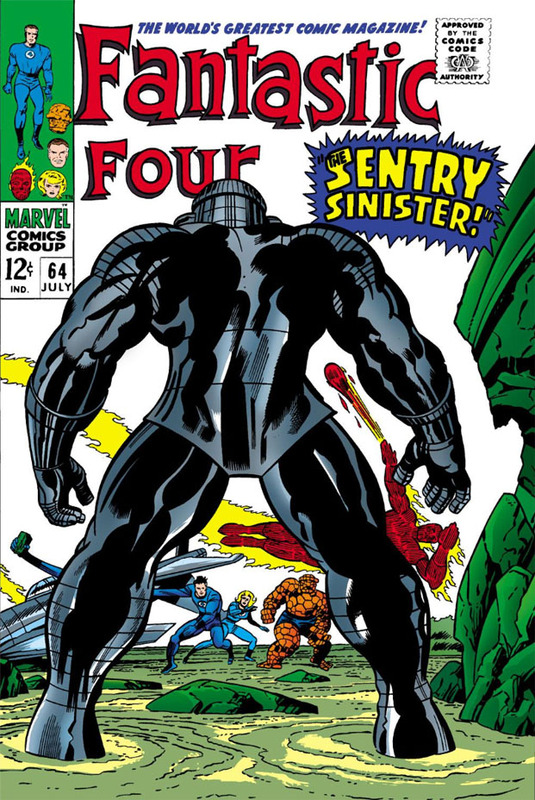 Following a second appearance in Fantastic Four that presents the Android as a common foe for both the FF and the X-Men, the Thinker's creation is often accompanied by his master in subsequent appearances, though that's not always the case. It's intriguing to see the Android in a situation where it must fend for itself as far as proceeding with a course of action without the directives of the Thinker guiding it, though that limits it to basically being something for the hero(es) to knock down or otherwise disable. The real treat is in seeing how a different artist will frame the Android and handle its attack. 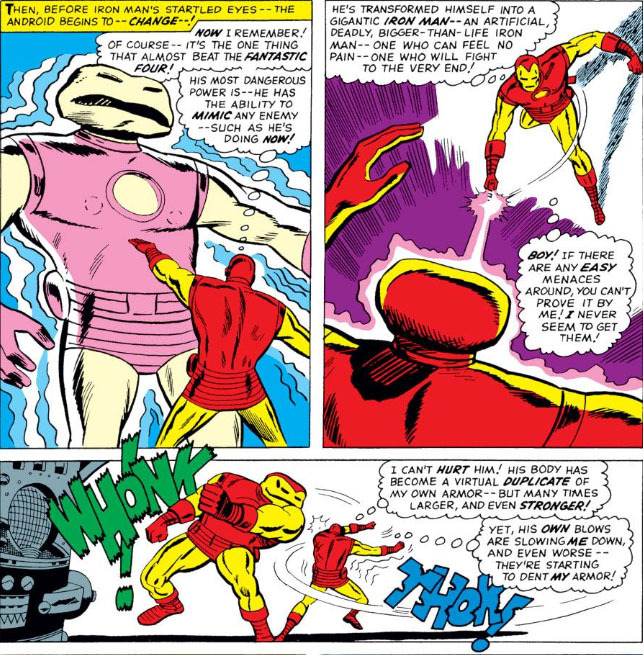 As we'll see when the Android goes up against Iron Man, its adaptation to its foe offers something of a (you'll excuse the word) comical approach to dealing with its target. Fortunately for Iron Man, the Thinker gets involved, inadvertently handing Iron Man the means to defeat both himself and his creation. Then there's the Android's meeting with Rom, who is mistaken for an android by the Thinker and thus attracts his interest. The battle scenes are nicely played out by artist Sal Buscema, whose introduction of the brute takes advantage of the Android's distinctive head--always an eye-catcher, and probably the thing that comes to mind for readers more than even his power. Later, we learn the Thinker has become dissatisfied with the Android's performance and washes his hands of him; but the Android's interpretation of his master's orders has him isolating himself within a rural barn. 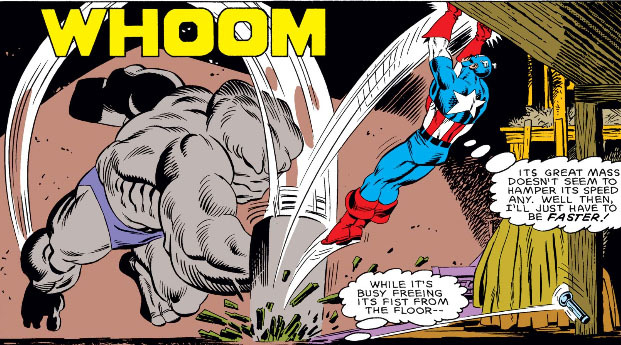 When a young neighbor makes a request to Captain America to investigate, Cap discovers an aggressive foe indeed--but only, as it turns out, some of the time. What Cap observes in his battle with the Android is that it eventually returns to an unmoving, standing position, just as Cap initially found it--a state which lasts only until someone gets within range. 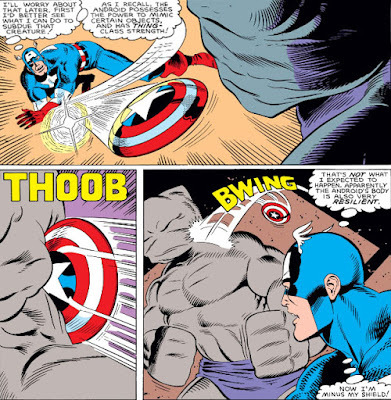 And while Cap has no way of knowing the how and the why, we see via flashback the details that led to the Thinker's decision to part with his creation; but Cap has reasoned that the best way to handle this threat is to simply leave it alone. Our tall, bulky friend might still be standing among the bales of hay in that barn, were it not for the Fixer--who isn't really the Fixer but the Adaptoid, who gains control of the Android for his own purposes. With new directives from the Adaptoid, the Android meets and battles the Avengers; but thanks to a helpful tip from Dr. Druid, the Android goes down for the count. With the Sub-Mariner now an Avenger, there's a certain advantage in having your headquarters based on an island, even one that's artificial. 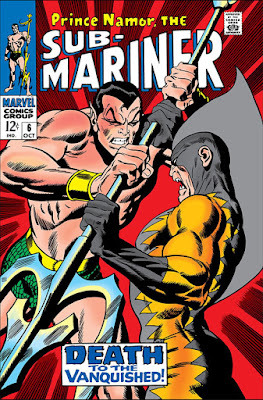 For instance, when hurling an awesome android into the water, Namor can follow, renew his prodigious strength, and make sure that the Android meets a grisly end. 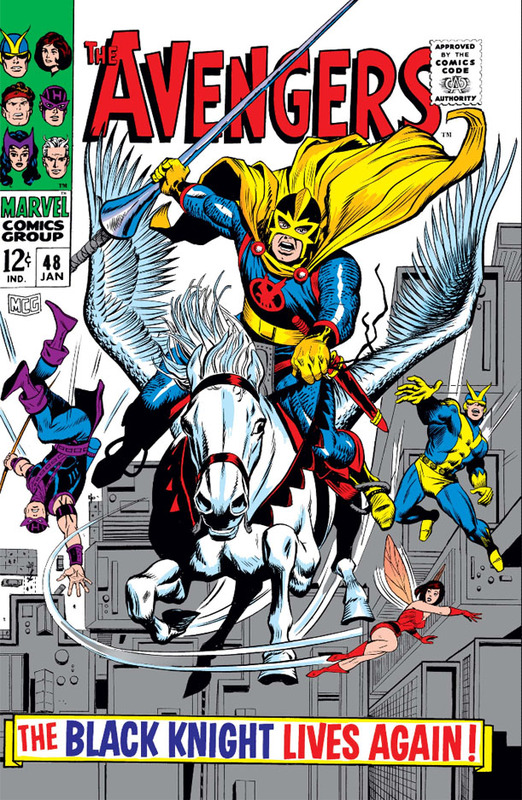 During the Acts of Vengeance, which would result in the destruction and sinking of Hydrobase, the Android reactivates and battles the Black Widow, Firebird, Moondragon, Hellcat, and Capt. Marvel before finally suffering defeat. Yet by now we realize that you can't keep a good Awesome Android down--and the blockhead would go on to have further appearances in various titles, whenever and wherever its awesome presence was needed. 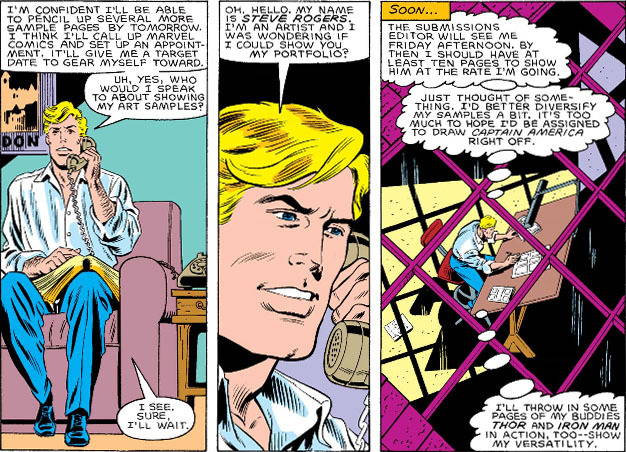 While there's little argument that Marvel knew what it had in Captain America, there was a point when it didn't quite realize what it had in Steve Rogers, Cap's civilian identity. 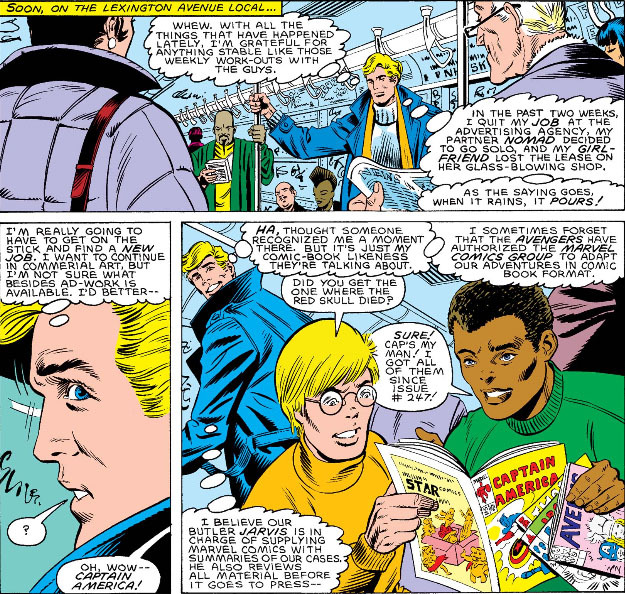 To explore the meaning of that, we need to return to late 1985, where Steve is pleasantly reminded of an arrangement that Marvel has with various heroes to document their adventures in comics form. 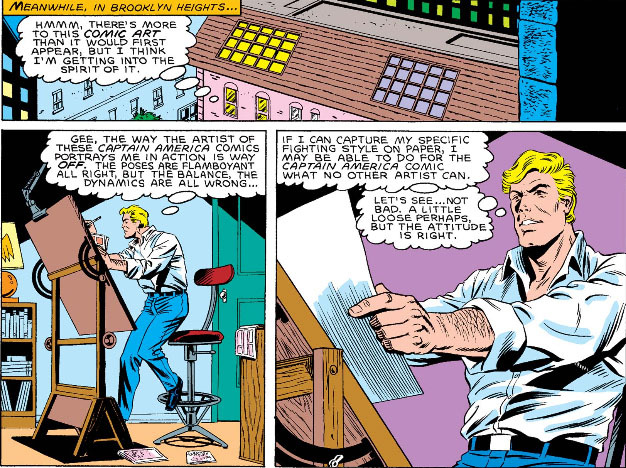 But for artist Steve Rogers, who's looking for work, the inspiration hits that he might be able to have his cake and eat it, too. The more Steve mulls over the idea, the better a fit it seems to him. Fortunately, this is all occurring to him in the mid-'80s; with comics' pivot toward more graphic violence in the '90s and away from the "good wholesome entertainment" that he's seeing in his sample copies, the shift in emphasis would likely be a deal-breaker for him. Steve has some polishing to do on his technique in order to break into the new medium, but he's eager to apply himself. 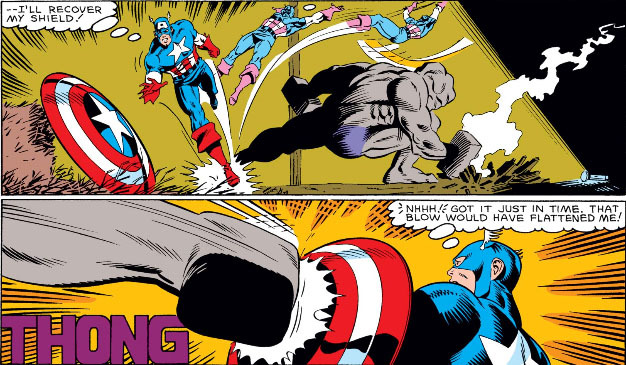 And who better to interpret the fighting style of Captain America? Steve has obviously made his decision and rolled up his sleeves. The next step is to pitch his work with Marvel. 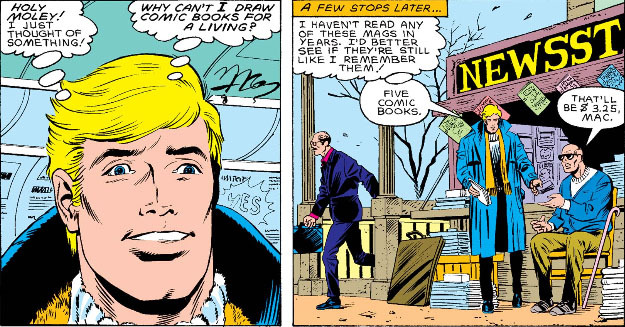 At this point in time, Jim Shooter was Editor-in-Chief of Marvel, while Mike Carlin was the editor on Captain America and Fantastic Four. Would Steve have what it takes to join the ranks of the Marvel Bullpen? The Searing Gaze of the Thermal Man! 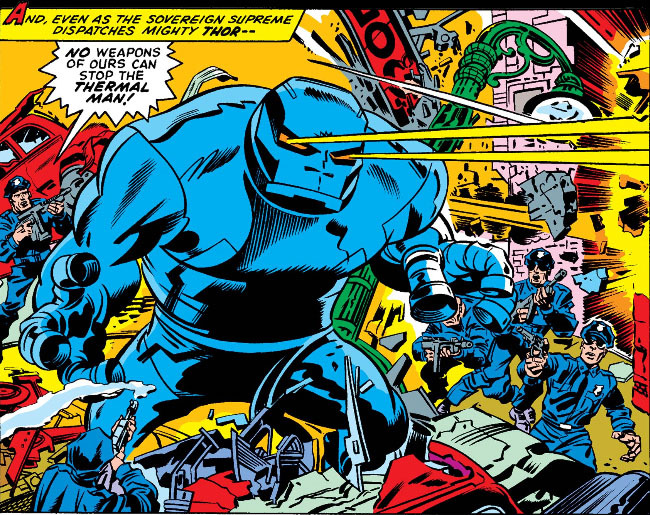 Along with Replicus and the Crypto-Man, the Thermal Man filled out a trio of deadly man-made constructs that gave the mighty Thor more trouble than they probably should have (as opposed to the Growing Man, whose incredible growth reflected the impact of whatever force was used against him and thus had him well matched against a powerhouse like Thor). 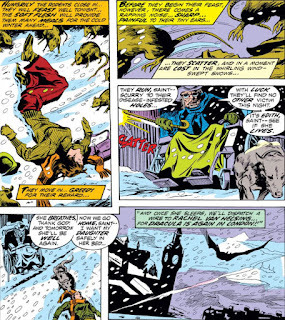 But like the Crypto-Man, who went on to face the Hulk and was indirectly responsible for the death of Jarella, and Replicus, who showed up over 30 years later for a rematch with the Thunder God, the Thermal Man got enough of a boost from battling a high-profile character like Thor to be taken out of mothballs and used in other stories. In battling Thor, the Thermal Man, like his brothers in armor, definitely started at the top; but, receiving a two-issue build-up before cutting loose in the third, it may be fair to say that he overstays his welcome in his first appearance. Aside from his bulk, which begins mainly at his upper body and has been mimicked by other characters, there's little in terms of design that the Thermal Man brings to the table--and granted, there's little argument that Thor has battled larger and far mightier foes. The Thermal Man's primary weapon is of course his thermal blast which he emits from his eye apertures, rays which appear to carry both incredible heat and a concussive force--the latter of which he can also emit from "fingers" which look like they were lifted from the Beetle. 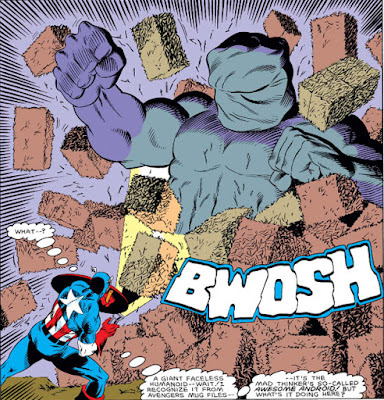 Needless to say, he's also capable of great strength--and his outer shell can withstand not only mortar fire but Asgardian steel, as well as a direct hit from Thor's hammer. And while it makes no sense to you or I that Thor can challenge Galactus with his hammer yet fail to shatter the likes of the Thermal Man into bits and pieces, that's nevertheless the story we've been given for our 15¢, folks. 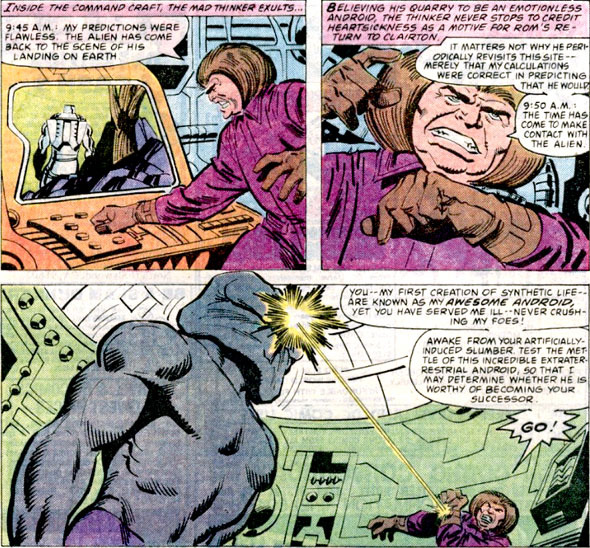 For what it's worth, artist Jack Kirby doesn't pull his punches with the Thermal Man's scenes; it's just that the character itself isn't what you might call inspired. Formidable, however, seems to be another matter. Just how tough is the Thermal Man? Does he rate as an opponent for the God of Thunder? Just ask the harried N.Y.P.D.--they'll take all the help they can get! From the Tribunal to the Council of Time to the Council of Cross-Time Kangs, no doubt by now you've seen your fair share of such assemblies of judgment in Marvel's wide range of stories, featuring gatherings of characters or entities that decided matters so wide in scope that our own concerns on Earth seemed trivial to inconsequential by comparison--a description that carries a bit of irony, since often the actions of such beings had an impact on or otherwise directly involved our world. Yet such councils have also originated on Earth, headed by those who are native to it and working behind the scenes with everyone's best interests at heart (the Illuminati being a distant example)--while in other mediums, gatherings such as the one in 1983's The Star Chamber more flagrantly abused their power to effect change. And who better to pick up that kind of gauntlet than Reed Richards? 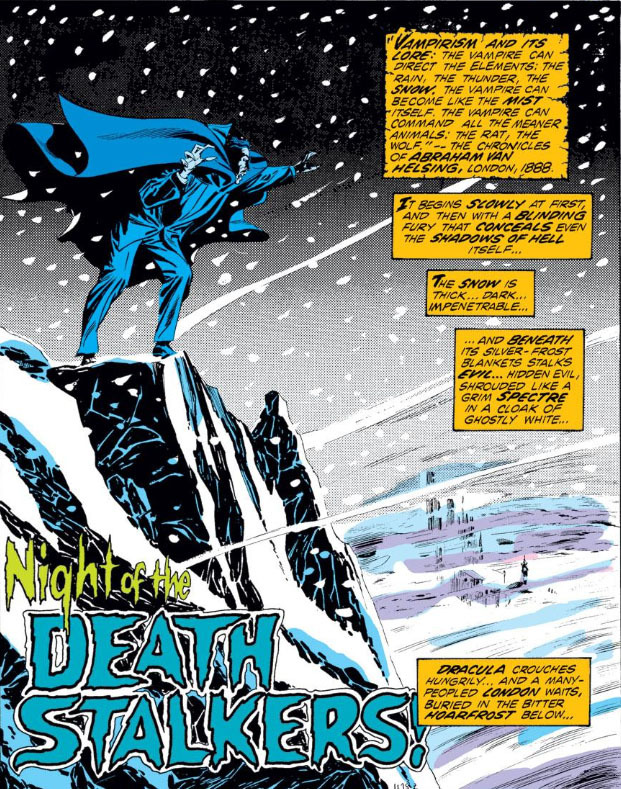 Perhaps Tony Stark, yes... but while both men were members of the Illuminati, and both made decisions they regretted during the events of Civil War, Reed might be the more likely person to emerge on the other side with his soul intact. And that's indeed the premise at the core of this three-part story. 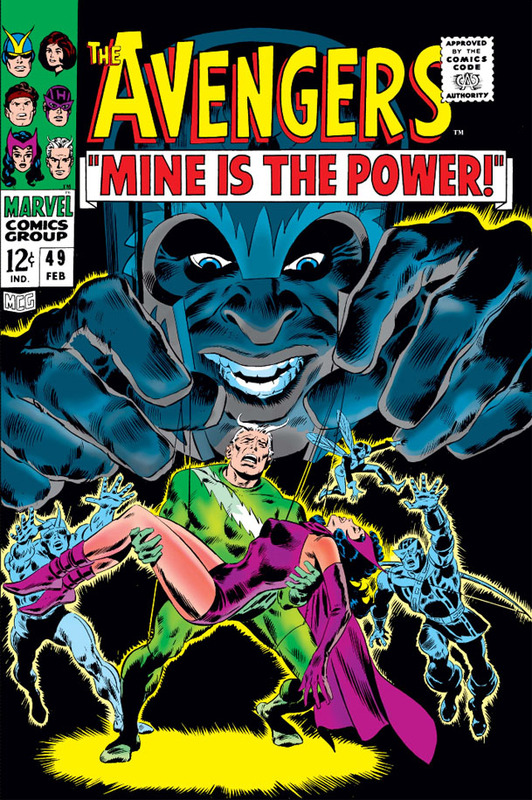 At the end of 1967, Avengers writer Roy Thomas took a series of steps which would pare down the Avengers and would effectively wipe the slate clean as far as their lineup--leaving a core group of Goliath, the Wasp, and Hawkeye, its smallest contingent ever, but quickly adding the Black Panther to their ranks and building from there. 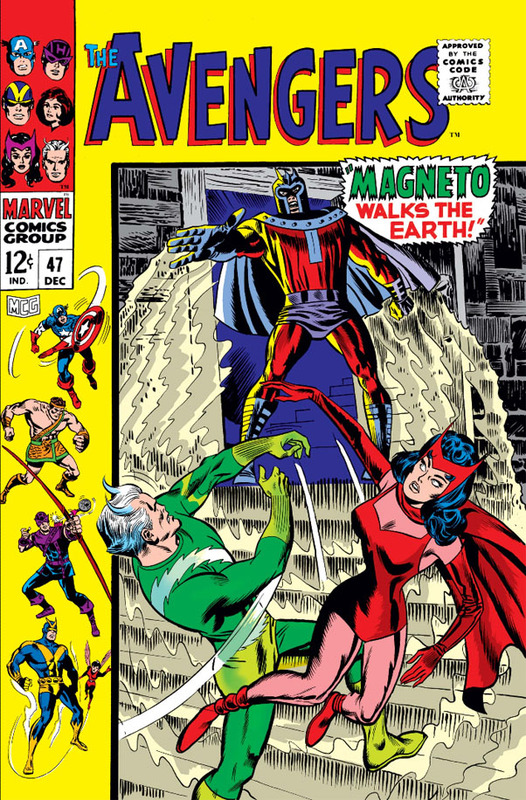 Seemingly crucial to Thomas's plans was the removal of not only Captain America, the group's most steadfast member and arguably the "glue" that held the team together, but also the departure of Quicksilver and the Scarlet Witch, who cut their teeth in the Avengers under Cap's leadership along with Hawkeye but were now for whatever reason seen as hangers-on. There were probably a number of ways for Thomas to have considered for Wanda and Pietro to justify their departure, since the pair are family and have always been joined at the hip as far as making decisions on what to do with their lives and who to form alliances with. But it's probably Thomas we have to thank for stoking the fires of anti-mutant feelings that Stan Lee had only touched on in X-Men and using them to suddenly turn Pietro from Avenger to outcast. Yet there was still Wanda to deal with. Further down the road, Wanda would eventually embrace her own bitter feelings toward humans (and then some); but at this point in time, Wanda didn't share her brother's growing disdain for humans, and was still the loyal Avenger. 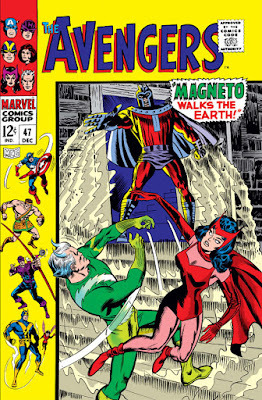 But a three-part story--which featured the return of Magneto, a former benefactor of Pietro and Wanda, and a man who had no equal when it came to despising humans--would solve both problems. OR: "Then There Was That Time When the Top Brass Chewed Out the Sorcerer Supreme..."
While the military enjoys a cooperative arrangement with the super-beings who often stand between humanity and those foes who prove to be too much for conventional forces to subdue, doubtless there are some within military circles who will (appropriately enough) bite the bullet when it comes to being assigned to approach the Avengers or lesser-known individuals in order to solicit their assistance with a threat to national security. Count Gen. Hoyt Emerson among them. Today, he enters the sanctum sanctorum of Dr. Strange--and he is not at all happy about it. Frankly, Emerson has a point. We know that Strange has many artifacts from across who knows how many dimensions--but what compels him to have every inch of his decor match his teachings? Does every room have to reflect the otherworldly? Pick up the phone and ask Jarvis to fix up a reception area for your guests, Doc--the man has impeccable taste! As for Emerson, he can join the club in regard to the level of frustration he feels, since his visit has soured Strange's mood, as well--interrupting his preparations for entering the Dark Dimension and nearly costing him his life in the process. To paraphrase Strange, whatever his visitor has to say had better be good! Strange, of course, assumes an air of civility by the time he greets the General and his aide--and given Emerson's bluntness and lack of, eh, tact, kudos to Strange for keeping his composure. Don't you miss the old Stephen Strange in such moments? The arrogant, tactless s.o.b. who used to treat his patients like meal tickets? Emerson would have been fileted like a fish. 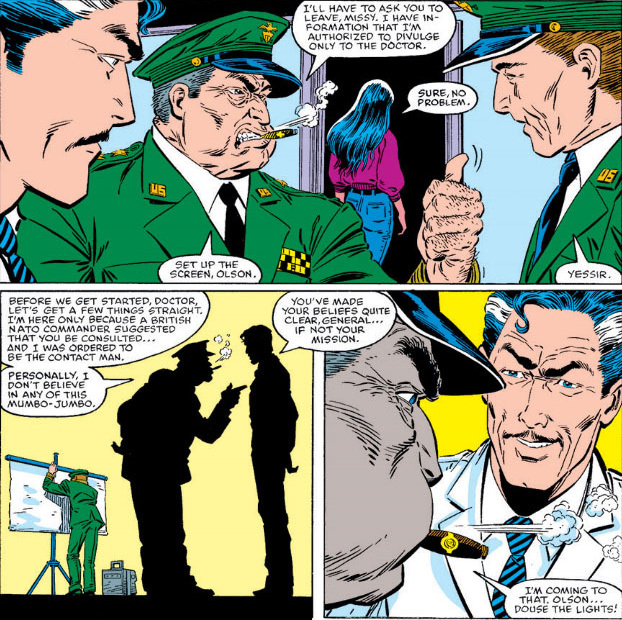 As it is, the current Stephen Strange stays reasonably calm and persuades the General to get to the point--which Emerson proceeds to do, with obvious reservations. But what kind of threat has the military knocking on the door of the Master of the Mystic Arts? And will its representative, the salty Emerson, have the patience to trust in whatever Strange has to say on the matter? 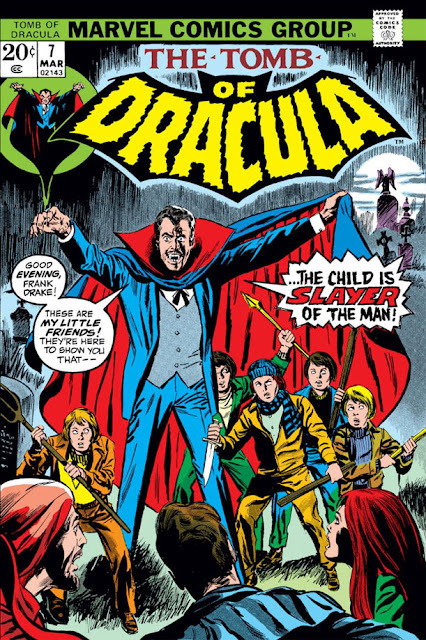 At the end of the previous Tomb Of Dracula story that saw our brave band of vampire-hunters under attack from a group of children that Dracula had enslaved into his service, you would think its follow-up in the next issue would have Quincy Harker and his group taking center stage. Instead, we would find that Dracula has already moved on, leaving Harker and his annoying pack in his rear-view mirror (if he could actually look in a mirror, that is) and engaging in a new scheme that would raise from the ground armies of vampires that would finally make it possible for him to bring the Earth under his rule. In these early stories, Dracula is obviously still thinking big in terms of conquest, instead of finding more subtle ways to rule the masses (such as his satanic church). Initially, he limited his activities to subverting the wills of key personnel stationed in various government positions throughout Europe, but only as precautionary measures to be used on an as-needed basis; yet it's never occurred to him to establish such control in greater numbers, and in more advantageous seats of power that would allow him to advance his agenda with impunity. At this point in time, his ambition and ruthlessness still override his innate sense of planning; and, just as with the Chimera, he prefers to seize any device or artifact that would provide him with a fast track toward world conquest. In this story we'll be witness to another such grab for power. 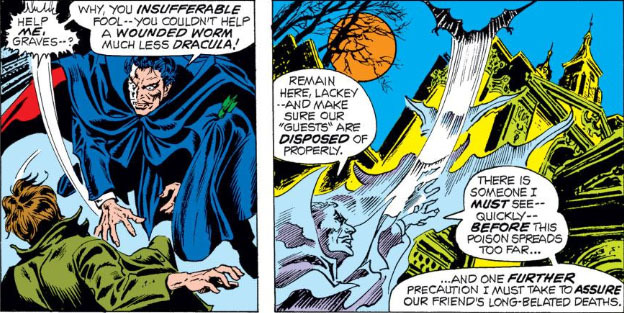 But, on the heels of the previous tale, Dracula must first eradicate a deadly poison delivered by a projectile courtesy of Harker before he and his group became trapped. 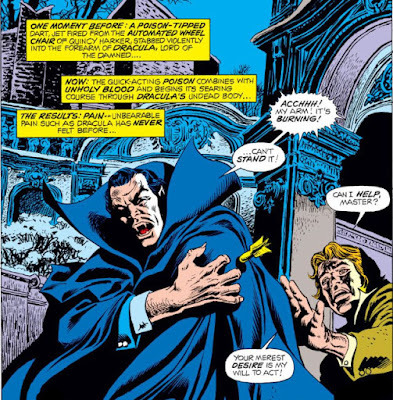 As we touch base with both Dracula and Harker, we'll see that both the story and Dracula himself do a fair job of multitasking. ...And The Children Shall Slay Them! 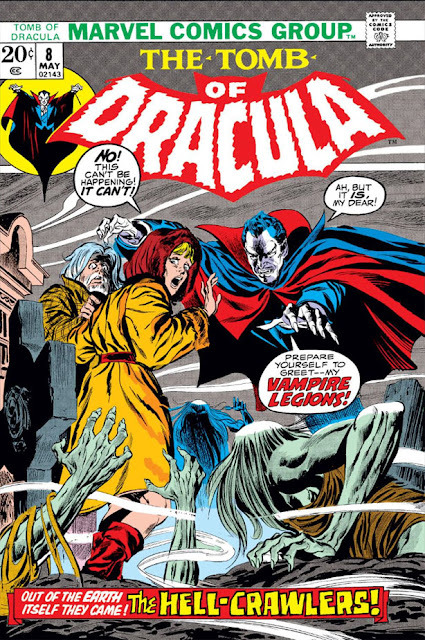 In the seventh issue of Tomb Of Dracula from March of 1973, writer Marv Wolfman joins artists Gene Colan and Tom Palmer to form a near-perfect team of creativity that would take the book through the next 6½ years (though Palmer would be absent for four issues after Wolfman's debut). Issue 7 begins a two-part story that would also see the introduction of Quincy Harker, the son of the man responsible for facilitating Dracula's arrival in London; and, through Quincy, the story is also the first to feature the formation of the dedicated if arguably ineffectual vampire-hunting group of Quincy, Rachel Van Helsing, her mute servant, Taj, and Frank Drake, whose long pursuit of Dracula culminated in Quincy's final confrontation with and subsequent slaying of the vampire lord. As for Dracula, he already doesn't seem too impressed by this new band of vampire hunters, if the average age of the humans he's enthralled from a nearby playground to battle the group is any indication. Thanks to the cover rendered by Larry Lieber, it almost seems like actor Christopher Lee will be playing our Count in this story--but inside, Wolfman and Colan (with Palmer) are already pooling their talents nicely for the issue's splash page that tempts the reader further--and with Dracula's aborted attack on Quincy's daughter, Edith, it becomes clear that this enemy of both Quincy and his father once again stalks London. Good lord--call for a cab, man! You really want your daughter dragged all the way home? 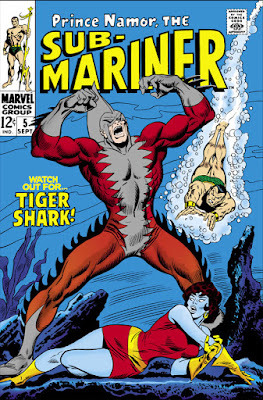 The introduction of Tiger Shark to the Marvel Universe may have proven little more than an annoyance to the incredible Hulk, but it proved to be fatal to the human father of the Sub-Mariner--and, back in the day, the character proved to be a considerable threat to the Atlanteans as well as to Namor himself. Obviously Tiger Shark is a force to be reckoned with, though the evidence of that assertion can seem a little unclear. 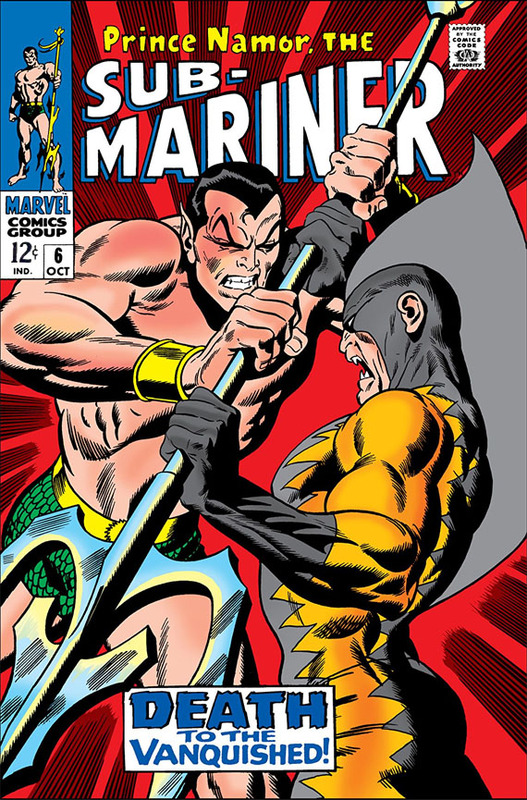 If Namor, who derives his great strength through contact with water, can humble the Hulk if their battle takes place beneath the waves, what sort of advantage could Tiger Shark hold that would not only let him defeat Namor twice, but also made it possible for him to usurp the throne of Atlantis? Is Tiger Shark truly the Sub-Mariner's superior? For the purposes of his introductory story, the short answer is: yes and no. Where Stumbles The Simple Surfer! Council Is Again In Session! The Prestige And The Power!